Do you ever feel like a mad scientist in the kitchen? I normally a recipe follower, so I don’t wing it very often. Of course, even with a recipe, the first time you make it is still an experiment. How will all the different variables perform in your kitchen? Sometimes it turns out amazing, sometimes not so much. This experiment, though, was a huge success. It was my husband’s birthday recently, and he wanted some of his favorite English foods for his party. One of the things he requested was mini-pork pies. I followed the recipe, basically, and the pork pies came out good, but I had a ton of filling leftover. I cooked it up and stored it in my fridge until I could think of what else to do with it. 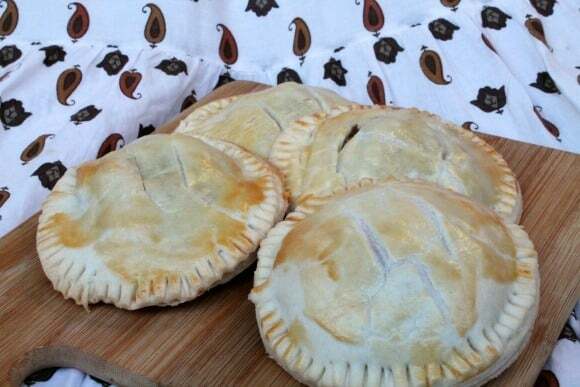 That’s when the idea for these hand pies came to me. 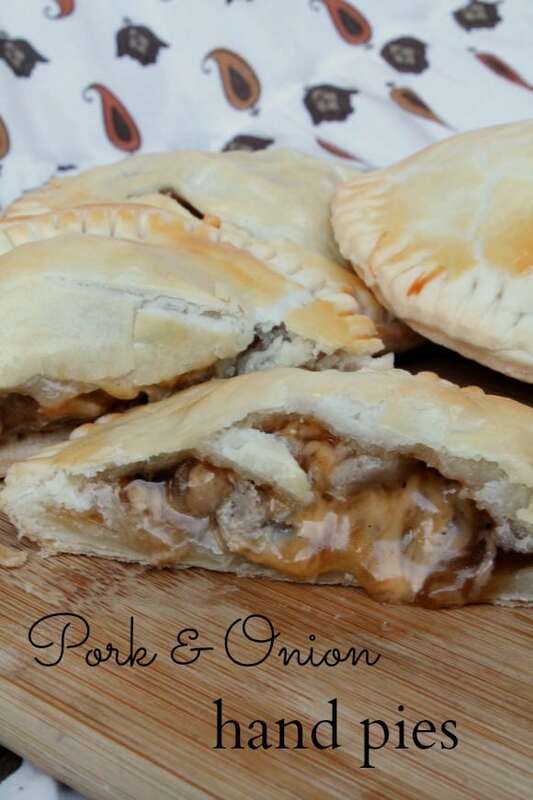 I made my life in a hot kitchen a little bit easier by using store bought pie crust and piled some pork and onion, jarred gravy, and shredded sharp cheddar onto rounds of dough. Each pie got a lid, got brushed with an egg wash, then got popped into the oven. I was nervous the first time I tried them. Some of my experiments have been less than awesome, including another one I tried this week with the rest of the leftover pork. But this one was heavenly. 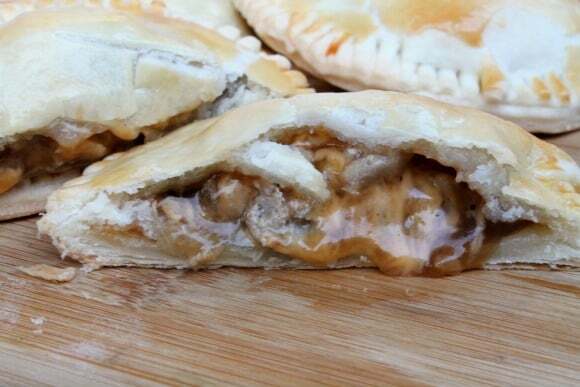 Soft flaky crust surrounding savory pork and onion, a punch of flavor and richness from the cheese and gravy. Man, I’m a genius. Experimenting in the kitchen can be exciting. And when it works, it not only satisfies your hunger, it also satisfies your creativity. Go mad. Make something awesome. In a large skillet over medium high heat, heat the oil, then add the onion and cook for about five minutes until the onion begins to soften. Add the pork, nutmeg, mustard powder, and Worcestershire sauce, and cook, stirring occasionally, until the meat is cooked through. You can do all of this a few days ahead of time and store the cooked meat in a sealed container in the fridge. Use leftovers from another recipe if you have them. Roll out your pie dough onto a lightly floured surface and cut 16 circles, about four inches in diameter. I was able to get 8 circles out of each sheet by re-rolling the scraps a couple of times. Place eight circles onto a parchment lined baking sheet or two. Add a big spoonful of pork and onion to each circle. Add a pinch of cheese and a large spoonful of gravy onto each pile of meat. Use your finger to trace some water around the edge of each dough circle, then place a second circle on top and press the dough together around the edges with a fork. Brush beaten egg over the top of each pie, then use a sharp knife to cut a couple of vents into the top of each one. Bake for 15 minutes for a sturdy, but softer dough, or 20 minutes for a more crispy pie. Allow the pies to cool for at least 10 minutes. The insides will be very hot. These are also great at room temperature. Feed your friends and family and revel in your genius.